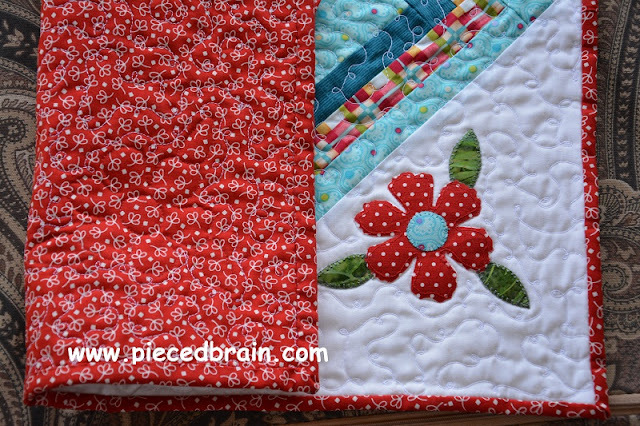 Quite a while back I reviewed the book Cute Quilts for Kids by Kristin Roylance for Martingale. In it, Kristin had a very fun butterfly quilt called "Butterfly Kisses" which featured a different way to make a butterfly block. I made one block and saved it. Last weekend I turned that block into this wall hanging (funky lighting on this photograph). I used scraps from my stash for everything. The fabrics look so good together and their prints add whimsy to the project. Butterflies without flowers look out of place so I added corner flowers and leaves. Loving it! 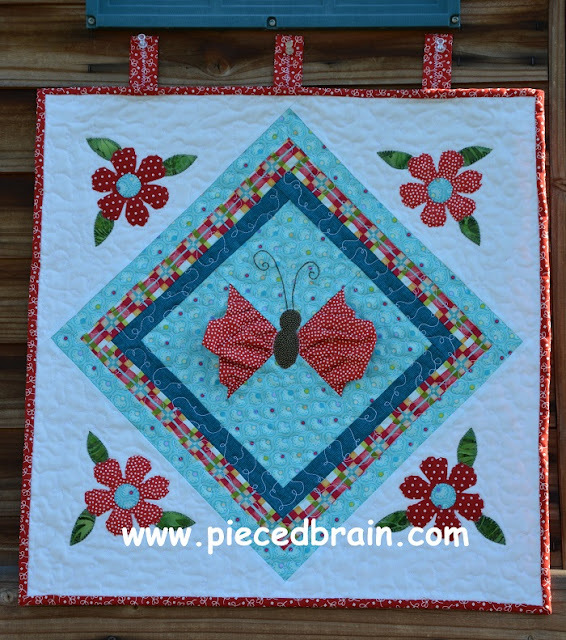 This one block quilt comes together fast and would look very pretty in the nursery or in a girl's bedroom. I backed and bound it with American Jane Bread n' Butter Red. This project measures 19" x 19" and has three hanging loops which I attached when I was stitching the binding. The flowers were machine appliqued with straight stitch and the leaves with blanket stitch. I quilted around all shapes with monofilament by Aurifil, and quilted loops with white thread to finish it all off. I hope this post will inspire you to create your own one [orphan] block quilt. When you do, send me a photograph and I will show it off here. I will link this post to Crazy Mom Quilts and Confessions of a Fabric Addict on Friday. Until then, happy sewing! This is so pretty and a fun use for that one block. I really like the dimensionality of the butterfly.